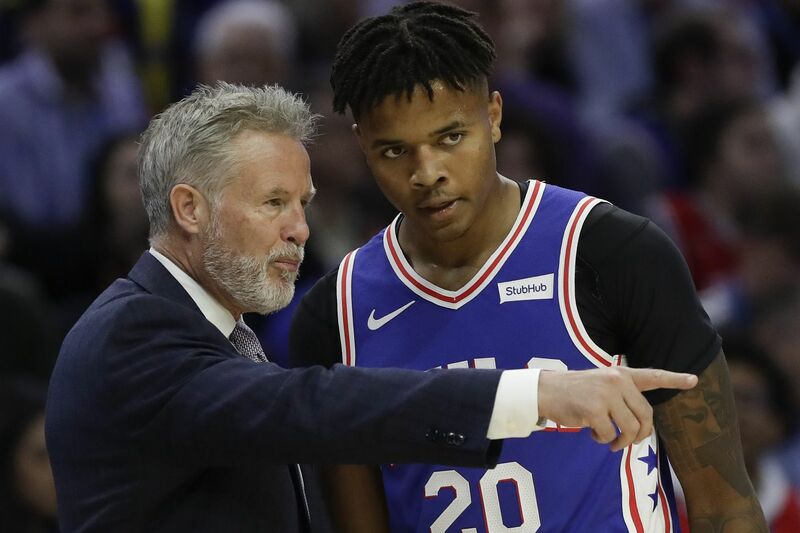 Sixers guard Markelle Fultz listens to Head Coach Brett Brown against the Chicago Bulls during the first-quarter on Thursday, October 18, 2018 in Philadelphia. The next time some foof on Twitter starts talking about Santa Claus or D batteries or any of the other commonly invoked tropes about sports fans in this city, pop into their mentions and hit them with the game tape from the Wells Fargo Center Thursday night. There are a lot of ways that Sixers fans could have reacted after witnessing the latest sign that the No. 1 pick in the 2017 NBA draft was still a disconcerting sliver of the player that his team needs him to be. What they did was cheer. It happened in the first quarter. If there was going to be a tipping point in the unqualified support that Markelle Fultz had enjoyed throughout his tumultuous Sixers tenure, this might've been it. Nobody was close to him. Nobody. The Sixers had caught the Bulls in a scramble. As the ball cycled around the top of the key, Fultz was all alone in the left corner. Robert Covington looked at the rim but turned down the shot in order to make the extra pass to the second-year guard. The closest defender was down by the low block, his back turned. Fultz could have dribbled twice and shot the thing like a free throw. The crowd wanted it, swelling into a roar. Shoot, they yelled. Instead, he demurred. "He said he didn't have his balance," Sixers coach Brett Brown said later. In this moment, the whole thing looked untenable. It's difficult enough for a team to have a shooting guard who can't shoot. One who won't shoot? Forget it. A couple of hours earlier, Brown had insisted to reporters that he would not hesitate to pull the plug on the experiment if that is what was required. JJ Redick would return to the starting lineup. Fultz would return to the bench. He acknowledged that, for all the thought that he'd put into the decision to switch things up, there was no guarantee the thing would work. Now, it looked dead. Fultz hesitated. He squared himself unsteadily. Instead of rising up and taking a shot that any guard at any level of basketball would take, he dribbled awkwardly toward the low block, where a thicket of defenders awaited. The crowd groaned, but then a funny thing happened. For the rest of the game, the 18,000-plus at the Wells Fargo Center seized upon any morsel of opportunity it could find to cheer the 20-year-old sophomore on. A routine mid-range jumper? A deafening roar. A hard foul on a drive to the basket? Wild applause. When he was open, they yelled for him to shoot. But, when he didn't, they did not boo. "It's amazing," Ben Simmons said after the game. "Philly's amazing." Sixers guard Markelle Fultz shoots the basketball during the third-quarter against the Chicago Bulls on Thursday, October 18, 2018 in Philadelphia. The questions did not disappear. They will not disappear. It's easy to look at a 127-108 win and see only the positives. Yet the questions arose for a reason, and they have yet to be answered. The most pressing issue confronting this team for the foreseeable future is still the short- and long-term future of the second-year guard who still won't shoot. There were plenty of opportunities for doubt during the first half Thursday night. On some possessions, the Bulls were barely glancing in Fultz's direction, instead using his defender to double-team Joel Embiid as the Sixers' big man turned in one of those performances that reminds you just how good he might yet become. Brown admits that he does not know how it will play out. What he does know, better than anybody else, is his team. And, right now, he thinks that there is a benefit to be gained from having Fultz playing with the starters. Perhaps we saw a glimmer in the fourth quarter. With just under nine minutes to go in the game, Fultz took the ball a few feet behind the arc. His defender looked on without interest from a few feet inside the line. The crowd welled into a wild, pleading roar. Shoot, they all seemed to say. This time, Fultz listened. He took a dribble forward, squared his feet, dipped his lower half into rhythm, gathered the ball into his hands, and rose up for a 26-foot jump shot that splashed through the net. "I worked hard this summer," Fultz said. "I shot threes. I shot mid-range. I worked on my game. I was comfortable shooting. I believed it was going in, which it did, so it felt good." The building exploded. So did the bench. As the crowd chanted his name, a grin spread across Fultz's youthful face. It was something. A moment. What did it mean? After it was over, Brown saw only the positives. He said he saw a player who was confident, aggressive, unafraid to take what the defense gave him. There might be some cognitive biases at play there. Positive ends can have a halo effect on the evaluation of means. One thing is clear. If Fultz fails to live up to his pre-draft billing, it won't be because of a lack of support.